Frack Free Mahoning Valley Injection Well prayer service conducted by Rev. Monica Beasley-Martin, this service will inform the people about the water, which is destroyed forever and pumped underground below all of us. We Thank our elected officials for banning Injection wells in our communities. We thank Pope Francis for his public view against fracking. ODNR Permitting these 2 injection wells in Weathersfield Township less than 1 Mile from Downtown Niles and only 3 miles from Downtown Warren. Our most beautiful brick and mortar buildings are in these cities. Who pays for earthquake insurance? Bessemer, PA – This afternoon, residents of Western Pennsylvania and friends of Lawrence County farmer Maggie Henry locked themselves to a giant paper-mache pig in the entrance to a Shell natural gas well site in order to protest the company’s threat to local agriculture and food safety. The newly-constructed gas well is located at 1545 PA Route 108, Bessemer, PA , 16102, less than 4,000 feet from Henry’s organic pig farm. The farm has been in the Henry family for generations and has been maintained as a small business despite pressure from industry consolidation. The Henry’s made a switch from dairy to organic pork and poultry production several years ago as part of their commitment to keeping the operation safe and sustainable for generations to come. Joining Maggie Henry at the well site are residents from other Pennsylvania counties affected by natural gas drilling and Pittsburgh-area residents of all ages who support Henry’s fight. Many are customers who buy her food at farmers’ markets and grocery stores who do not want to see the integrity of their food source compromised. 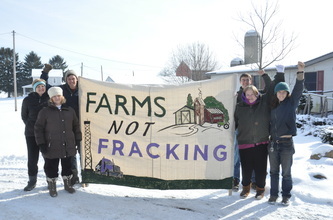 The Henry farm is especially vulnerable to the risks associated with fracking because it is located in an area riddled with hundreds of abandoned oil wells from the turn of the 20th century. According to hydro-geologist Daniel Fisher who has studied the area, “Each of these abandoned wells is a potentially direct pathway or conduit to the surface should any gas or fluids migrate upward from the wells during or after fracking." Methane leaks from gas wells have been responsible for numerous explosions in or near residences in Pennsylvania in recent years. Migrating gas and fluids also threaten groundwater supplies, on which Henry and her animals depend for their drinking water. Last summer a major gas leak in Tioga County, PA caused by Shell’s own drilling operations, produced a 30 ft geyser of methane and water, which spewed from an unplugged well and forced several families to evacuate. 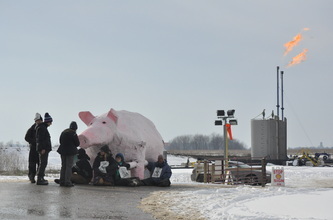 The nine ft. tall pig is stationed in the driveway of the site with four protestors chained to its' legs, obstructing traffic to and from the site. The protestors are wearing signs that read, “Fracking Threatens Food” and “Protect Farms for Our Future”. A couple dozen supporters are also on the scene. Nick Lubecki, one of the protestors locked to the pig, recently started a farm of his own in Allegheny County. He worries about the future of agriculture in Pennsylvania, which is the state’s number one industry. “It is extremely disturbing as a young farmer to have to worry about the safety of the water supply in a chaotically changing climate while these out of state drillers have the red carpet rolled out for them. In a few years the drillers will all be gone when this boom turns to bust like these things always do. I don’t want to be stuck with their mess to clean up." Prior to this action, Henry exhausted all avenues to prevent or shut down the well through the legal system. Supporters of her farm have also held previous protests at the site. Despite the heightened risks posed by the abandoned wells in the area, Shell is moving forward with their operations, and Maggie’s supporters have turned to civil disobedience. The action comes on the heels of escalating civil disobedience across the continent to stop extreme energy projects, like fracking, strip mining, and tar sands oil mining, which destroy communities and fuel the climate crisis. Last week a coalition of Appalachian and Navajo communities impacted by strip mining, blockaded Peabody Coal’s headquarters in St. Louis, MO. And earlier this month protestors in eastern Texas erected a tree sit blockade to halt construction of TransCanada’s Keystone XL pipeline, slated to transport crude oil from the devastating Tar Sands mining in Alberta, Canada to refineries in Texas. http://www.ustream.tv/channel/yahktoe from the rally and march Sat. July 28, Wash. D.C. UPDATES: Special team was called to the scene to remove anyone blocking access to the injection well. Police are asking citizens that are there in support for their names and social security numbers. Citizens being instructed that they cannot park on public road nor can they take photographs. Citizens have now moved their cars to a private field. Supporters are gathering and there is a rally at 1 pm. 2 miles from Fisher Rd. intersection on the left. The police have separated the protestors from the woman chained to the blockade. They have surrounded her with trucks that are running to block all sound as an isolation tactic. Police have declared the site a crime scene and no one except press are allowed at the site. Newspaper reporters are present and a film crew has been called. Approximately twenty supporters are in attendance and staying nearby. ~ via Nate E on site in Athens, who can be reached at 740 856 9388 . FOR IMMEDIATE RELEASE: PLEASE REPOST THIS, AND FORWARD IT TO MORE PEOPLE! IF YOU RUN A WEBSITE, FACEBOOK PAGE, LISTSERVE, OR BLOG, PLEASE POST IT THERE! IF YOU ARE IN THE AREA, PLEASE COME OUT AND JOIN US! BRING A SIGN! AN ACT OF CIVIL DISOBEDIENCE IS CURRENTLY TAKING PLACE! A CITIZEN IS BLOCKING THE GATES TO THE FRACK-WASTE INJECTION WELL ON LADD RIDGE ROAD NEAR HWY 50/32 WEST OF ATHENS, OHIO. The citizen has locked herself to the gate of the well-site, effectively shutting down the well, and is demanding that the ODNR test the frack-waste that is being dumped in Ohio! WE DEMAND THAT FRACK-WASTE WATER BE TESTED! WE DEMAND THAT THE ODNR TEST FRACK-WASTE! WE ASK THE ODNR TO KEEP OUT-OF-STATE FRACK-WASTE FROM BEING DUMPED IN OHIO! WE ASK THE STATE OF OHIO TO END THE CONFLICT OF INTEREST BETWEEN BIG ENERGY COMPANIES AND STATE REGULATORY AGENCIES! ODNR HAS THE AUTHORITY to test the frack-waste that is injected into these wells. Citizens have asked them to test it many times. Yet THE ODNR REFUSES TO TEST THE BRINE. NEARLY 148 million gallons of fracking waste was dumped in Ohio last year, half of that from fracking wells in Pennsylvania and West Virginia, states where the EPA has banned or limited injection wells. WHY DOES THE ODNR CONTINUE TO ALLOW TOXIC WASTE THAT IS KNOWN TO CONTAIN CARCINOGENIC AND EVEN RADIOACTIVE COMPONENTS TO BE DUMPED IN OHIO WITH NO TESTING? THE ODNR RELIES ON INDUSTRY REPORTED NUMBERS concerning waste water chemical content, and waste water volume. Allowing the oil and gas industry to continue self-monitoring and self-reporting IS NOT strong regulation. THIS IS A GROSS CONFLICT OF INTEREST. The ODNR gets paid by the barrel for each load of toxic waste that is dumped in Ohio. A significant portion of their budget comes from the oil and gas industry. THIS IS A CONFLICT OF INTEREST. SB315 DOES NOT PROVIDE ADEQUATE PROTECTION FOR OHIO CITIZENS! IT WAS DRAFTED AND APPROVED BY THE OHIO OIL AND GAS ASSOCIATION! OHIOANS HAVE THE RIGHT TO KNOW! WE ASK THE ODNR TO EXERCISE THEIR AUTHORITY UNDER THE LAW BY TESTING THE FRACK-WASTE! WE ASK THEM TO PROVE THAT IT IS SAFE! WE ASK OHIO TO END THE CONFLICT OF INTEREST BETWEEN BIG ENERGY COMPANIES AND STATE REGULATORY AGENCIES! WE DEMAND THAT THE ODNR EXERCISE THEIR AUTHORITY! TEST THE BRINE! DIRECTIONS TO LADD RIDGE WELL SITE FROM ATHENS, OH: HWY 50/32 W for two and a half miles/ LEFT on Fisher Rd. for about 3 miles/ RIGHT on Ladd Ridge Rd, WELL SITE IS ABOUT TWO MILES UP ON THE LEFT.